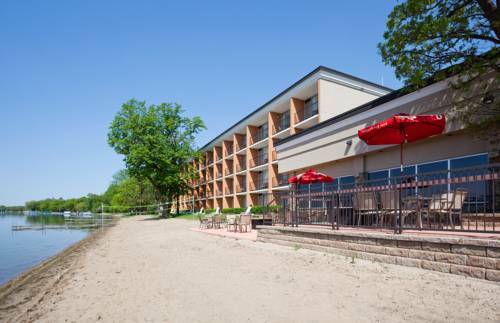 Enjoy Our Hotel's Location in Detroit Lakes, MNOur hotel's proximity to the beach of Big Detroit Lake makes it the ultimate destination for Minnesota vacations. Because it is situated just off Hwy 10, the Holiday Inn Detroit Lakes is convenient for business travelers, as well.If you visit Minnesota for vacations, there is no better place to stay. Go into town to find great deals on shopping or just lie on the private beach and soak up the sun. If you enjoy the outdoors, visit the Tamarac Wildlife Refuge, go to the Mississippi headwaters or hike, bike and snowmobile miles of local trails.Corporate guests will not be disappointed with their stay. We have five meeting rooms to offer with a total capacity of 350 people. You can finish work in our Business Center using free Wi-Fi access. Businesses like SJE-Rhombus, Team Industries and BTD Manufacturing are all nearby in Detroit Lakes, MN.Our hotel's smoke-free facilities are sure to impress. Have a boat? Use our private dock to put it on the lake. We rent out boats and bikes of all kinds, as well. The kids can enjoy a foosball game in the game room or run around on the playground. If you don't feel like grilling outside yourself, the Ice House Restaurant serves juicy, choice cuts and fabulous burgers daily. You can even enjoy live music or karaoke while drinking margaritas on the beach at the Holiday Beach Bar & Grill. There's no end to the fun you'll find here on Big Detroit Lake! The Ice House Restaurant is an iconic staple for the community and surrounding area. It has a reputation of great views with excellent food and service. The menus include, breakfast, lunch and dinner. The salad bar is one of the best! The Holiday Beach Bar and Grill features american cuisine with a casual dining experience and don't forget about our beautiful patio seating right on the beach. It's a breath taking view. The Mall has several small shops to enjoy plus the Cinema theatre is located with in the mall as well. Dairy Queen, Pizza Hut and Chinese Dragon are also located in the mall as well. ~5 miles from Detroit Lakes. ~33 miles from Detroit Lakes.